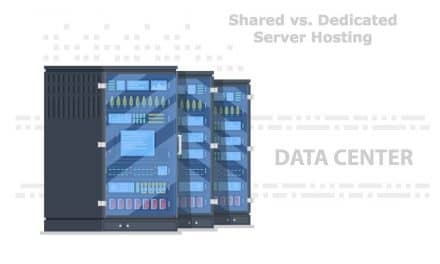 You might even think of going ahead with a custom domain name with paid hosting. But soon you will be taken aback when you will come to know about technical and monetary hassles involved in creating a website. But not anymore. If you want to create a free website or a blog in a matter of few minutes, then Blogspot is the ideal choice. I will go a step further and will let you know that you can even earn money from a blog. You must be thinking that I am going crazy! Fortunately, No! Within few minutes you will learn how to create free blog or website on blogspot.com in step by step process. Before we move any further, it is important to know what and why around Blogspot. 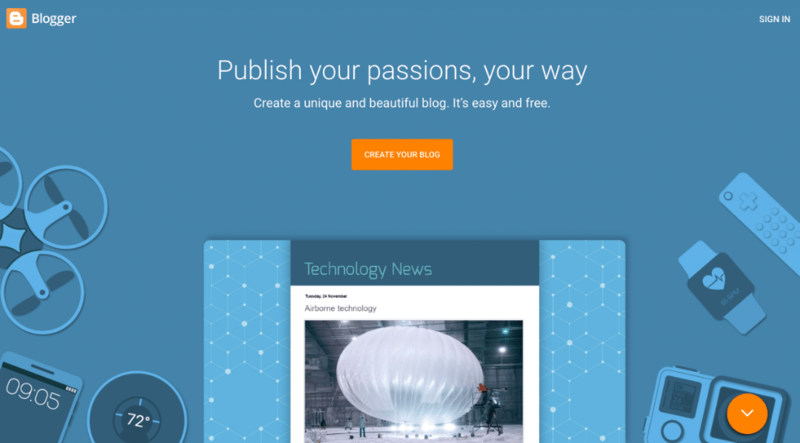 Blogger.com is a blog publishing service which was initially developed by Pyra Labs. Later in the year 2003, Google purchased it. Google hosts the blogs at a subdomain of blogspot.com. If you try to open blogspot.com, then you will be redirected to www.blogger.com. Blogspot is a free blogging platform just like any other blogging platforms like wordpress.com, etc. The best part of this platform is that it belongs to mighty Google. So, if you have your regular Gmail account, then you do not even have to sign up for an account on blogger.com. Blogspot has the inbuilt functionality of Google AdSense. If your blog or website has visitors, then Google will make sure that you make extra bucks out of it. Isn’t amazing? 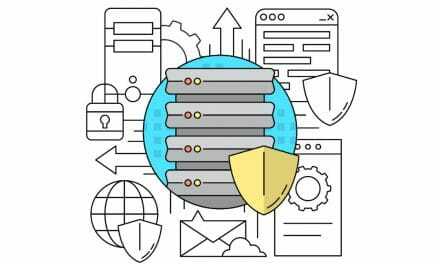 Every free blog platform, including Blogspot, does have a few limitations like domain name restriction, dependency, etc. Now, some of you may ask that why not go for better stuff like a website with a custom domain, paid hosting, etc.? 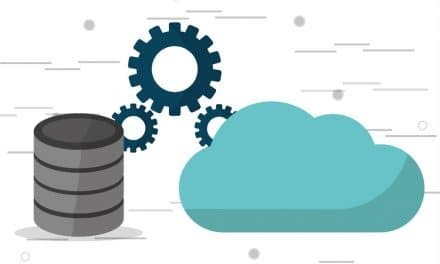 For sure, you can go ahead and create a website with a customised domain name and paid-hosting service but the need of a site should be justifiable. Initially, the idea of a blog or website looks very exciting, but over the period it demands your time and involvement. Running a blog is no joke. It does require your time and effort. 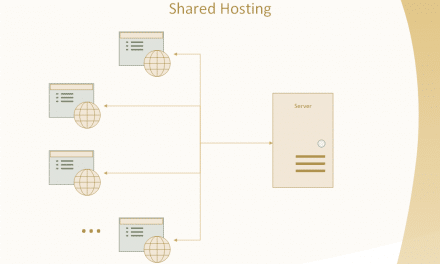 Therefore, free blog platforms such as blogger.com, WordPress, etc. gives you ample opportunity to test and hone your skills. And when you feel that you are ready, you can convert your domain on Blogspot to paid domain name. Play safe! The whole set up process will take few minutes to one hour based on the amount of customization you want on your blog. So, let’s start right away. Open any internet browser and type in www.blogger.com. You will see a screen like below. Click on “Create your blog” or “Sign in”. You will see Google usual login screen as below. 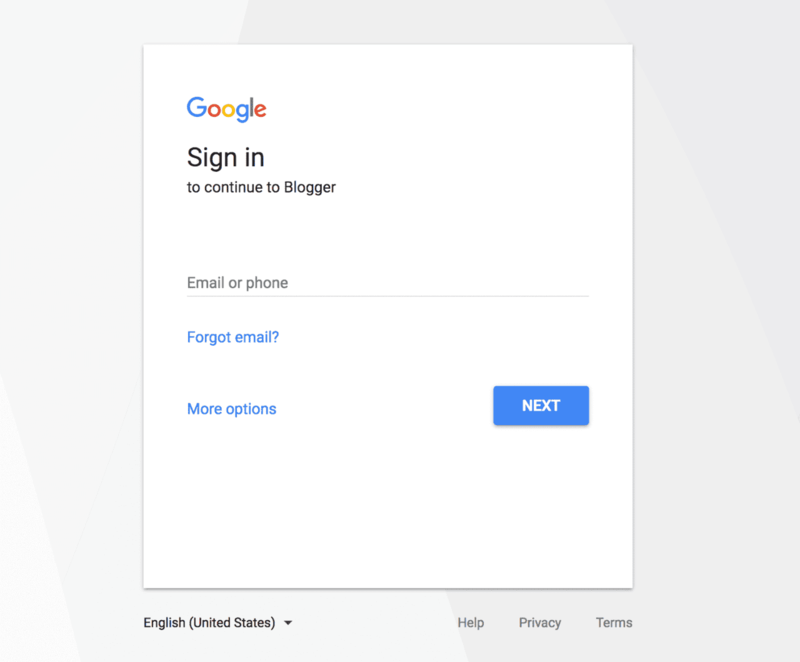 Enter your Google login credentials to proceed further into blogger. In case, if you do not have Google account then create one. 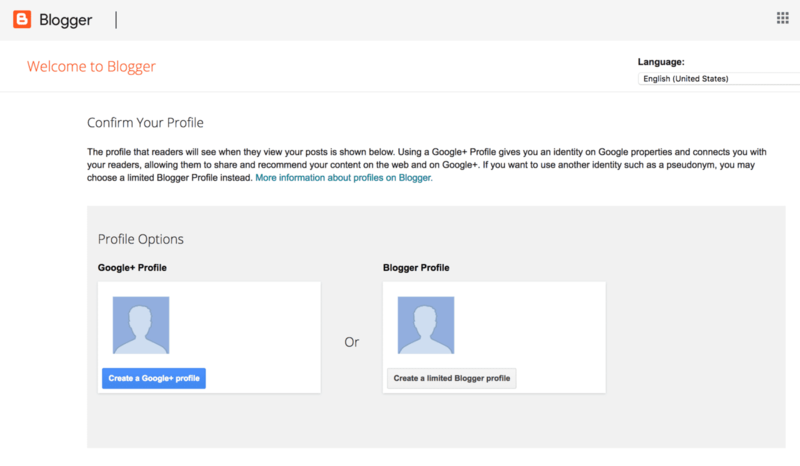 After successful Google login, you will move to Blogger’s basic page where you will have to confirm your profile. 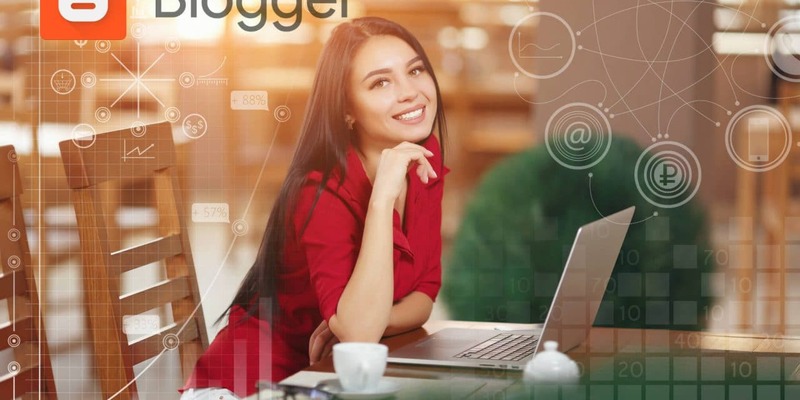 To make your life easier, I will suggest you to choose “Create a Limited Blogger Profile”. Now you can see welcome blogger page as below. Till now you were successful in creating your profile on blogger.com, but still, you have not created your blog. 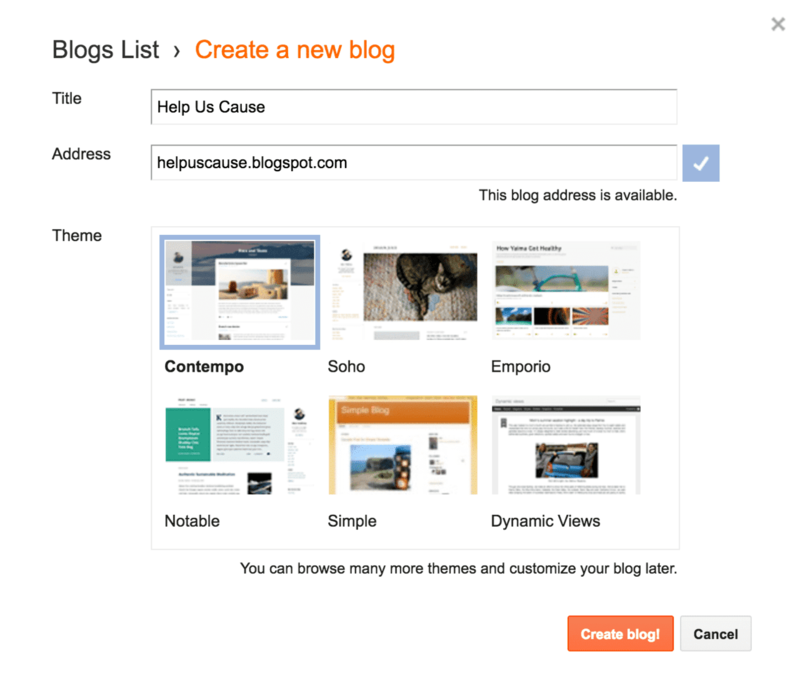 For this, you have to click “Create New Blog”. This the first step of the whole setup process. You have to write a title and address of your blog. Make sure you come up with unique domain name or address. Your domain name will look like this yourdomain.blogspot.com.I would suggest here to think wisely since later you may have to transfer this domain name to your custom domain name. 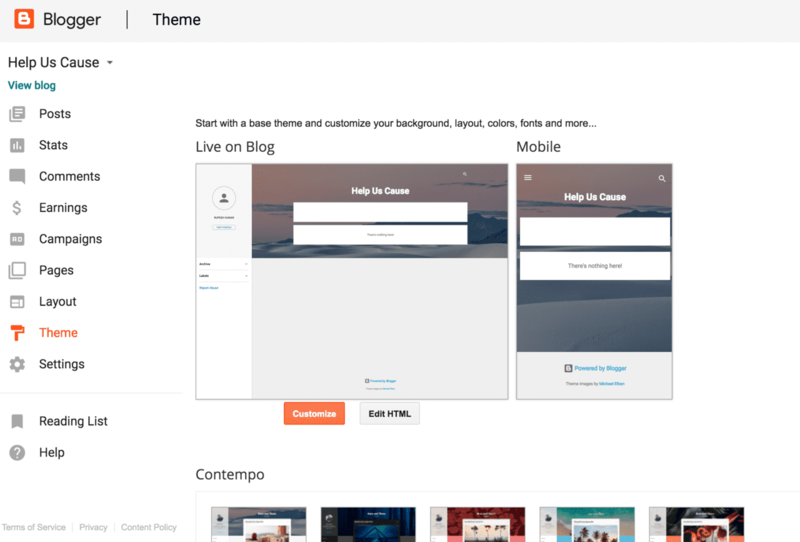 The next step is to select a suitable theme for your blog. Voila! your blog is created. 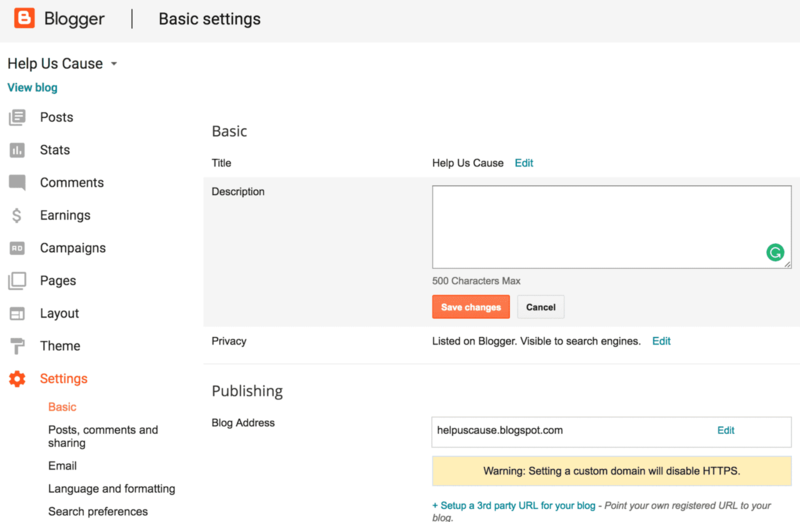 But still, you have to configure necessary setting like description, comment moderation, search preference, etc. Based on your theme selection, you will have to arrange a couple of things on your newly created blog on Blogspot. 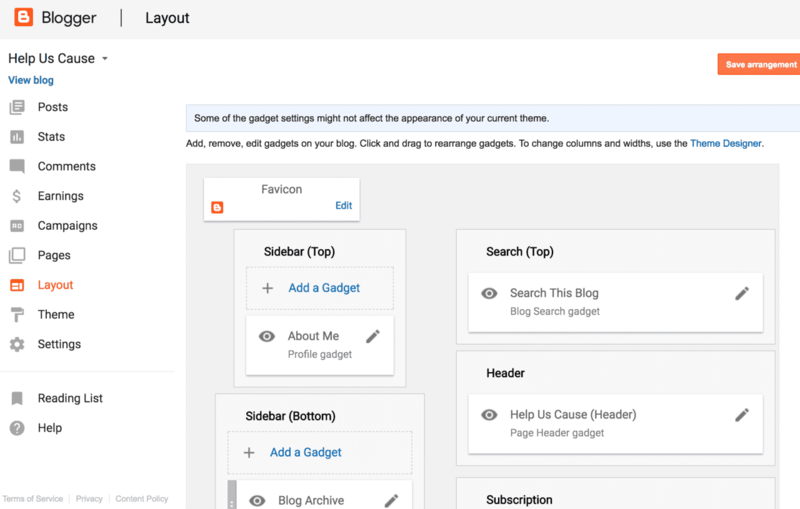 Go to layout section and here you can set Favicon, widgets, footer, search bar, about me, etc. You should complete most of the parameters for a gorgeous look of your blog. Now you are set to unleash your writing skills in the form of post or article. The layout is more or less like simple writing pad with basic options. 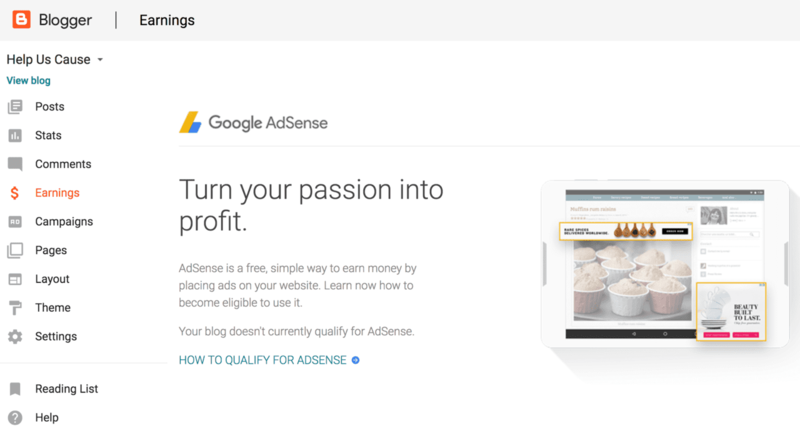 Google AdSense is the most loved way of earning money on a blog. The good news is that your blog has the inbuilt functionality to integrate Google AdSense. Here I would like to recommend you to read Google Adsense qualifying requirements in detail. Blogspot may not be the best blogging platform, but for sure it is the easiest. I started my journey with it and later shifted to a paid website on WordPress CMS platform. I will not suggest anyone who is new in this business to burn their hand with a paid website concept. Try and test any free platform like Blogger and then make an informed decision. Lastly, if you face any problem while creating your blog page, then post your questions in the comment section. Please share this article on social media platforms like Facebook, Twitter, etc.